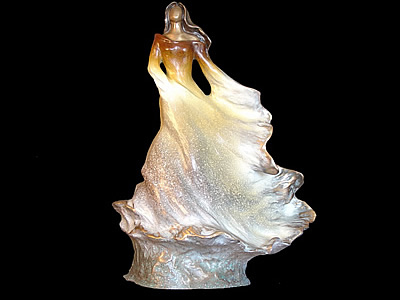 traditional bronze sculptures, oil paintings and watercolors. We have carefully gathered a collection of our most popular and requested works for your viewing. All of our pieces are handmade, museum quality works of art and not mass-produced reproductions. Dodson Studios is a very unique partnership. It brings together two artists with skills that each has acquired over a twenty-eight year period. Jim and Judy Dodson began their art careers separately, but when they married in 1993, their talents combined to form Dodson Studios. To read the full story of Dodson Studios, please visit the Dodson Studios page. Dodson's Studios' work is featured in public and private collections all over the world. Each bronze sculpture, whether eight inches or eight feet high, is lovingly crafted, with careful attention to quality and detail. Each bronze sculpture is created individually from an original concept and developed through the mold making and finishing process. 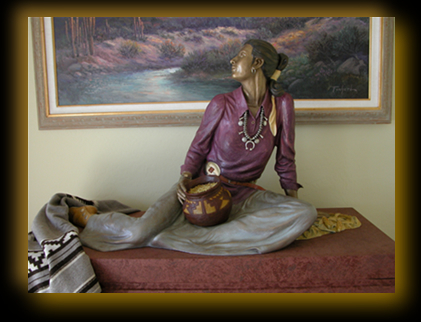 The finish on each bronze sculpture is a unique patina which Jim Dodson has developed over many years. It has become the trademark of the Dodson Studios bronze sculptures. Please contact Dodson Studios for information on private showngs or commissions. Email jimandjudy@dodsonstudios.net or call 602-549-9055. Please contact us to find out what shows we will be at this year: jimandjudy@dodsonstudios.net or call 602-549-9055.